The Meyer is most likely a cross between a lemon and a mandarin. Meyer lemons are yellow and rounder than a true lemon. 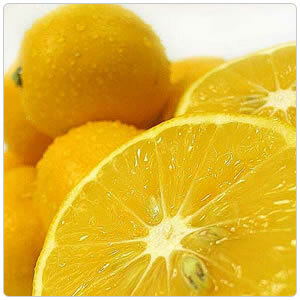 The skin is fragrant and thin, colored a deep yellow with a slight orange tint when ripe. Meyer lemons have a sweeter, less acidic flavor than the more common Lisbon or Eureka lemons. The pulp is a dark yellow and has very few seeds. Raw in salads, garnishes, cocktails, juice. Good in Marmalades, preserved, jams, compotes. Like most citrus, Meyer lemons originated in China where they have been grown for several hundred years. Frank Meyer, a plant explorer for the U.S. Department of Agriculture, found them growing in Peking and introduced them to the United States in 1908. Meyers are grown in the Central Valley from Fresno to Sacramento as well as thousands of homeowner’s backyards.